Today is my last day in Chile, so today’s column will build upon what I wrote last week. I have three charts that illustrate how Chile’s pro-market reforms have been great news – especially for poor people (or, to be more accurate, for Chileans who used to be poor). 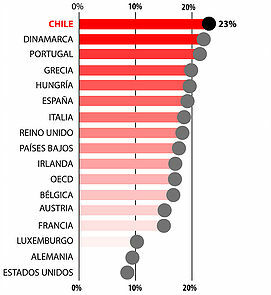 We’ll start with this chart from the most recent issue of Economía y Sociedad, which shows that there’s more mobility in Chile than any other OECD nation. Honest folks on the left should view this as unambiguously positive. Similarly, this Gini data (measuring the degree of inequality) should be slam-dunk evidence of progress for all left-of-center people. For what it’s worth, I don’t care about the Gini coefficient. What matters to me is economic growth so that everyone can get richer. If rich people happen to get richer faster than poor people (like in China), that’s fine. And if poor people happen to get richer faster than rich people (like in Chile), that’s fine as well. What irks me is that folks who fixate on inequality often support policies that retard growth. In other words, they’re so worried about rich people getting richer that they advocate for bigger government, which makes it harder for poor people to become richer. Economic growth, by contrast, truly is the rising tide that lifts all boats. Which is why this final chart (based on the Maddison database) is so powerful. 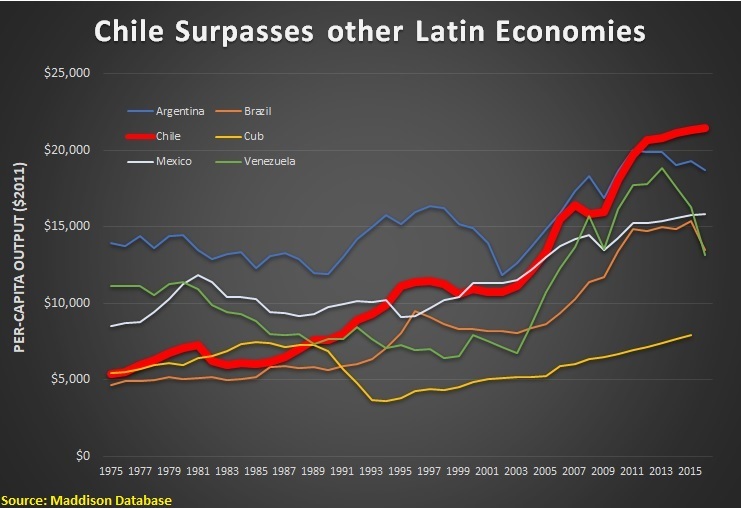 It shows 1975-2016 income trends for Chile (red) and other major Latin American economies. As you can see, Chile started near the bottom and is now the region’s richest nation. Wow, Chile didn’t just converge. It surpassed. It’s also worth noting how nations such as Argentina, Venezuela, and Cuba have enjoyed very little income growth over the past 40 years. The bottom line is that those nations are evidence of the costly impact of statism, while Chile is an amazing example of how capitalism generates widely shared prosperity. P.S. I’m not claiming Chile is a perfect role model. It is #15 in Economic Freedom of the World, so there is considerable room for improvement. But I am arguing it is a successful example of how better policy is great news for all segments of society. See my https://mises.org/library/direct-chile for another piece on this issue.